Hello everybody. This is Aylin from Posh Nail Art. 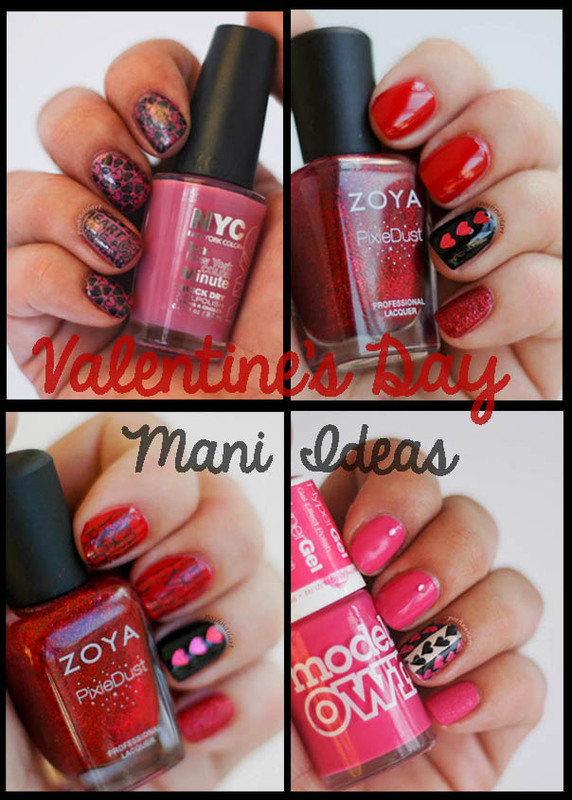 Since Valentine’s Day is around the corner, I thought I might share a few Valentine’s Day manicure ideas for you this month. I used 2 main colors for my manicures, pink and red, obviously and some stamping. My first mani is a bubble gum pink color. I used the same color for the index and middle finger and added tiny pink rhinestones. The pinkie is a textured bubble gum pink. Textured polish may be old news, but being a big fan of it, I try to use textures as much as I can. 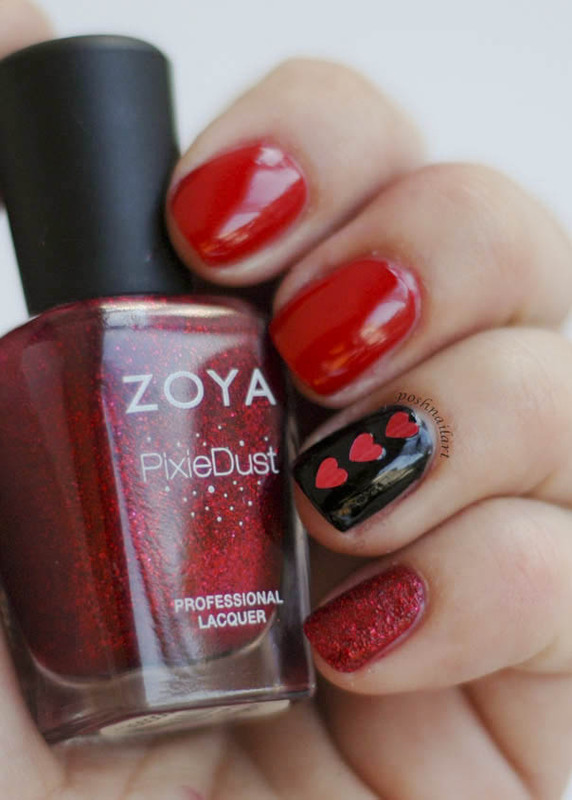 The ring finger was painted with a beige color and then stamped with the hearts. I filled in the pink little hearts with the help of a tiny brush. The second mani is also pink, but instead of using one color, I made a pink gradient with two pink tones. Over the gradient, I stamped the hearts and the writing and finally added a holographic topcoat. I wish I had taken a few pictures before the holographic topcoat, because the gradient cannot be seen clearly in the pictures. 🙁 But still, I think the little hearts look lovely and highly suitable for Valentine’s Day. 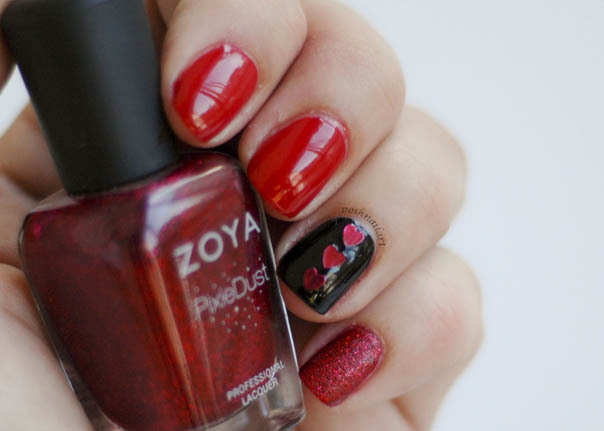 The third mani is all about red… I love pink, don’t get me wrong, but to me, red is the color of love. Combined with black, red makes the perfect base for this special day. For this mani, the pinkie is a red texture, again (this is one of my favorite textured polishes). 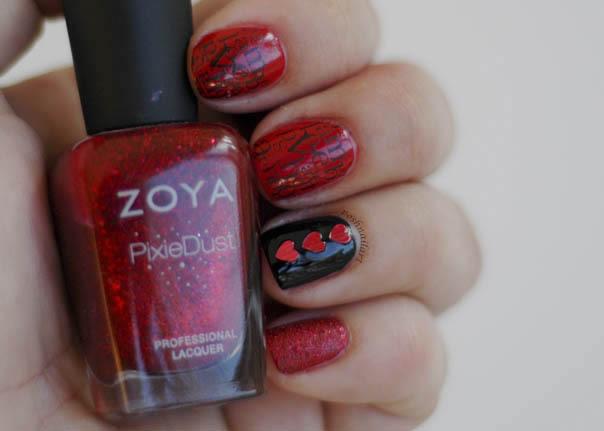 The index finger is 2 coats of black with red confetti hearts. And the rest is… pure red. You may leave this mani as it is, simple yet elegant and enjoy your special day like I did below. 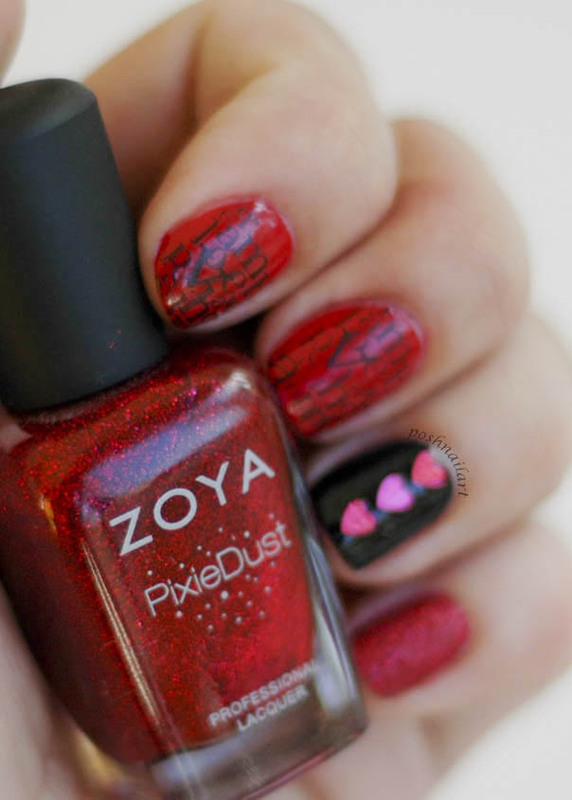 Or…..
you could add some stamping to give it a different look, like the one below. So, which one of these are you going to try this Valentine’s Day?